Who Should the Grammy for "Best Rap Album" Go To? What Lil Wayne means to the entire culture of Hip Hop is indescribable. It’s not often that someone self proclaims themselves as the best in their particular field, and it eventually becomes a common consensus, but this is what the multi-platinum, multi-Grammy winning, Hollygrove, New Orleans Rapper did. He made up the minds of millions of fans worldwide, and emerged as the GOAT for an extended period of time. What did all of this success mean to New Orleans? Simply put, everything. A few weeks back, visual artist, Ceaux painted a mural of Lil Wayne in his Hollygrove neighborhood (8401 Olive St. New Orleans, LA), and it sent the internet in a frenzy, 1. Cementing Ceaux as one of the most important creators in the entire city of New Orleans, 2. Reminding everyone that Lil Wayne will always be a staple in New Orleans Hip Hop culture. Lil Wayne tweeted a picture of the mural, and thanked Ceaux for his reverence. Now, E. Buckles has picked up the torch of honoring Wayne, as he composed an entire event dedicated to Weezy F. E. Buckles, like Ceaux has emerged as one of the city’s greatest minds, and creators. With his groundbreaking film, ‘Katrina Babies’ in production, E. Buckles is looking to tell the history of New Orleans, the impact Katrina had on Millennials, and how Beautiful art was birthed out of its plight. What was the soundtrack for most Millennials during the difficult times of Hurricane Katrina? Lil Wayne’s music. With the tribute at House of Blues in New Orleans, E. Buckles shined his light on that very reality, and the reality of Wayne’s impact overall. In our interview, E. Buckles talks about what Wayne means to him personally, why did he feel responsible for bringing this event to life, what does he think he means to New Orleans, and so much more. 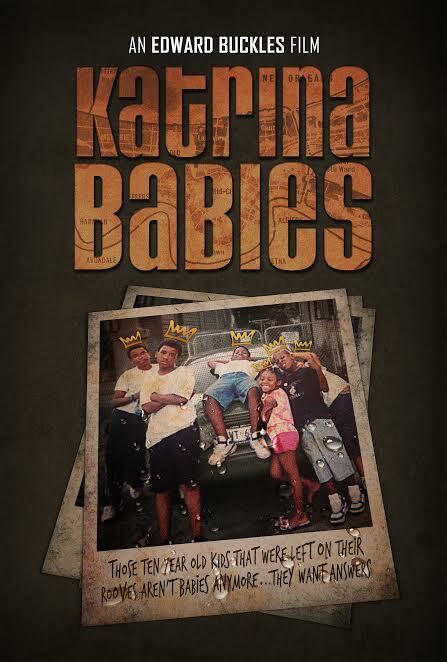 You can check out the interview below, as well as the poster for E. Buckles’ upcoming film, ‘Katrina Babies’. What sparked the interest to dedicate this installment of House of The Young to Lil Wayne? Man. Wayne plays a crucial role in the young New Orleans culture that currently exists. I’ve been working on a documentary, “Katrina Babies”, for about 3 years now and a great percentage of the youth that I’ve interviewed considered Lil Wayne to be somewhat of a hero during hurricane Katrina. He was therapy for many of us. His music was used for coping and he made us feel proud to be from New Orleans even at it’s lowest point. I speak on behalf of young New Orleans when I say that we appreciate that. I’ve noticed all of the BS that’s been going on with Wayne and his situation and I just wanted to do something on behalf of New Orleans to let him know that at the end of the day, WE GOT HIM. I wanted him to feel some organic love from the city. It’s love. What was the moment prior to the event that let you know it would be a success? I think the moment that got me really excited and start to feel that the event would be bigger than I expected was when I finished the promo video of New Orleans natives saying what Wayne meant to them. When I finished shooting and editing that piece I was bucked up. You can really feel the love in the video and I knew that once I posted it online, New Orleans would go ape. I knew that the video would show people how much they love Wayne and how important he is to New Orleans and the rest of the world. Once I posted it, it did exactly as I expected. People from everywhere felt it. That video had Lil Wayne and House of the Young as a trending topic in New Orleans for about 3 days strong. People were tweeting lyrics and saying how they felt about Wayne and all that. It was dope. What did it mean to you to have Wayne shout you out on Twitter? One of the greatest feelings I ever experienced. When I first got the call that he was going to see the video, I was kind of numb. If you are my age and from New Orleans, Lil Wayne means a lot to you. You know how NYC has Jay, Chi town has Ye – we have Lil Wayne. To think that one of my videos are saved in his phone is still crazy to me. It makes me smile real hard son haha. That’s one of the GOATS. When I learned that he was not only going to watch the video but he wanted to post it as a lead up to him announcing “LILWEEZYANA FEST”, that was a feeling like no other. It felt like I was collaborating with him from a distance. That’s big to me. I felt accomplished but I also knew that meant a larger task was at hand, ‘House of the Young’ event had to be near perfect. Major shoutout to my girl @HomeGurlHeather of VH1 for making sure that she got the video in the right hands so that it even got to Wayne. She did not have to do that and I appreciate it. She saw something that I didn’t. She knew that the event and video project could be something larger and more timeless. I definitely appreciate her for that. Discuss the process of making a House of The Young come to life? The process of bring HOUSE OF THE YOUNG together is just a bunch of chess moves man. Mad team work. I thank God that I finally have a strong team to make plays with. We create great promotion tools like flyers and videos and we just feed it to the people. We work really hard to make sure that our events are of taste and wavy stuff. We create these events with love. What was the best part about shooting the promo video? The best part about shooting the promotional video was seeing people get mad excited when speaking of Lil Wayne. I instantly knew that the project would be bigger than a promo video. It had too much passion and energy in it. That shows how much love people have for Weezy in New Orleans. What’s your favorite Wayne song? Wayne verse? + Wayne album? Now I feel like I’m being interviewed for the Lil Wayne tribute video haha. Man I think my favorite Lil Wayne song would have to be “Suffix” over the “Dear Summer” beat and “Oh Lets Do It” of course. Favorite verse is def the one on the “Suffix” track. I couldn’t tell you my favorite album that’s hard. but the Carter 2 is up there. But yeah That song “Suffix” gave me so much during the Katrina stages, matter fact that whole mixtape did. If you had to work with Wayne in some capacity, what would it be? If I could work with Wayne on any level, of course I would want to shoot with him but with a cause. Even if it’s only a music video, I would want it to mean something to New Orleans. But I got some ideas that I can’t let out of the bag yet, like he said in the tweet, “stay tuned”. What was the energy of the room for this House of The Young? The energy in House of the Young was amazing man. People were there to have a good time. They were excited and happy to be in the room. We sold out before the event even started so we had at least 200 people outside that could not experience it in which I feel bad about. But the event was magical man. It was like being apart of an award show’s honors segment but only in a club and way less formal haha. There was Lil Wayne art, music, choreography, poetry, everything. It was a great night fam. Why did you feel like you were responsible for bringing this event to life? I feel that I was responsible for bringing this project to life because my brand ‘House of the Young’ is known for being tasteful, fun, and most importantly FOR US. I didn’t want this project to be put on by the culture vultures. If i am going to do a film, event, or anything, it will be done for my people and my city and it will make us look good. That’s why I wanted to be the one to produce it to keep it a stack. Why did you pick the DJ that you did? DJ MUSHATT is my favorite DJ. Not only because of the fact that he spins crazy but because he is a really good person man. That dude has a great spirit and is easy to work with. He was there when I couldn’t afford to pay him for gigs and I will never forget the so he will always get the first call when I produce events. Plus he knows how to get the asses shaking haha. What do you feel like your role in New Orleans is? In short I feel that my role in New Orleans is to be the eyes for the city and with my camera show the beauty and reality of the people who truly make up this city. I feel that I’m a culture pusher and protector as well. 100 percent.